In response to last week’s “Twitpic of the Week” from atop Slotzilla, we had a listener ask if people where allowed to go to the top of the attraction just to take pictures or enjoy the view. @FSELV replied that, at this time, it is not an option. Only those who have purchased ride wristbands are allowed into the tower. This week’s winner comes to us via @HOBLasVegas with credit given to ksmazrouei (which minimal research did not reveal who that was) for a beautiful aerial shot of north-mid strip, taking from, what had to be a helicopter. The photo is so well lit that it looks like it could be a model of the strip. Featured in the foreground is the Mirage and includes everything south, at least in parts, on both sides of the road starting at Casino Royale down to Tropicana and City Center including the High Roller. All this set with a large stretch of desert leading to mountains with a blue cloud filled sky. 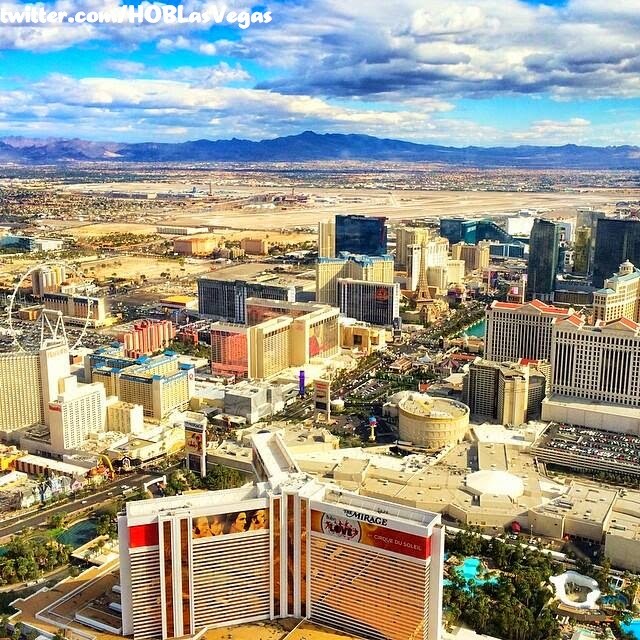 Pictures like this one support the thought of Vegas as an adult playground and represent it in play set form. Through the topography into the mix and now you have art.